The world is full of squiggles, patterns and shapes just begging to be photographed. Let me know if you're interested in purchasing the use of one of these images. The garden is where I find a lot of inspiration, food, beauty, bees, butterflies and a few weeds. Let me know if you're interested in purchasing the use of one of these images. 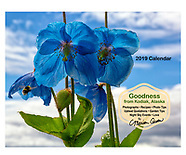 This 28-page wall calendar is created by Marion Owen of Kodiak, Alaska. Each month is a collection of yummy and easy recipes, fun holidays to celebrate, quotes, and beautiful photos. Printed in the USA. Includes a FREE cut-out post card. Ideal for RV, home, sauna, office. A lovely gift that encourages happiness. Whether I'm photographing landscapes or wind turbines, the very best thing I can do with my work is to encourage the viewer to pause and ponder that maybe there is a Something Else behind that image. (Let me know if you're interested in purchasing the use of one of these images). Most of these images are taken around Kodiak Island, where I live. This area is blessed with phenomenal--and close--opportunities to photograph all kinds of birds and wildlife. (Please give me a shout if you're interested in purchasing the use of one of these images). 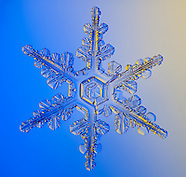 In the winter, I live for snowflakes! I create these images by photographing through a home-built microscope. I catch snowflakes on a board. Then I pick one up with a paintbrush and transfer it to a glass slide. It's a process I've worked on for 15+ years. I hope you enjoy them. Let me know if you're interested in purchasing the use of one of these images. From cookies to candles, every day is a day to celebrate the Spirit of life. Please let me know if you're interested in purchasing the use of one of these images. And so the expression goes, "The earth laughs in flowers." Let me know if you're interested in purchasing the use of one of these images. There's nothing like macro photography to slow your world down a notch or two. Please let me know if you're interested in purchasing the use of one of these images. Work, work, work. There are many aspects of making a living. As a photographer, I should know! Speaking of making a living, please let me know if you're interested in purchasing the use of one of these images. How many times do you see someone and say, "Wow, what a great face!" Here is a sampling of some of my favorites... Let me know if you're interested in purchasing the use of one of these images. Who doesn't like puffins? I spend a lot of time each summer photographing puffins. And, so you don't get bored, I've included other birds in the collection. And so, let me know if you're interested in purchasing the use of one of these images. Black and white images are my first love in photography. I've spent many an hour in the darkroom. Enjoy the images, and please let me know if you're interested in purchasing the use of these images. Going to the city is always a shocker to this Kodiak, Alaska girl. But when I bring my camera along, it's so fun! In any event, please let me know if you're interested in purchasing the use of these images.